The Double N+ Wireless USB Adapter connects your desktop or notebook computer to a wireless network. 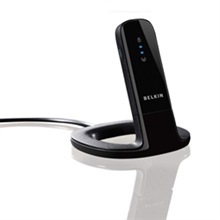 It provides optimal wireless range and speeds when paired with a Double N+ Router. Providing greater range and faster speeds, N offers an excellent solution for transferring large files such as video, music, photos, and documents among the networked computers in your home. Based on the 802.11n standard, N Wireless enables multiple receivers and transmitters to send and receive data using Intelligent MIMO (Multiple Input Multiple Output) spatial multiplexing techniques which greatly increases speed, coverage, and the reliability of the wireless network. Dual-Band technology operates on 2.4 GHz and 5 GHz frequency bands. Security with the push of a button. A Wi-Fi Protected Setup Push Button is included on the Adapter.